Ever since its inception, Mercedes-Benz has made unrivalled luxury cars and continues to do so to this very day. But what if you wanted a Mercedes upgrade – say something faster and with higher performance? You go see AMG. Mercedes-AMG GmbH, more commonly known as AMG, is the high performance division of Mercedes-Benz. A former Mercedes engineer started AMG in 1967. His goal was to customize, improve and add high performance equipment to Mercedes-Benz cars. He did this so well that Mercedes finally bought him out and took control of the company. Today, Mercedes-AMG GmbH is a wholly owned subsidiary of Daimler AG. Typically, AMG cars have bolder looks and higher levels of performance, with better handling, better stability and better engines than their regular Mercedes-Benz counterparts. AMG models are usually the most expensive and highest-performing variant of each Mercedes-Benz vehicle. AMG builds are badged with two numerals, as opposed to regular Mercedes-Benz vehicles that have three. That brings us to the Mercedes-AMG GLC 43 4MATIC Sports Utility Vehicle or SUV. As the moniker suggests, the 4MATIC means all wheel drive. In an odd way, SUV really doesn’t sum up this vehicle. Instead, ‘crossover’ might be the better term. The GLC 43 is fast and fun to drive. While at the wheel, you really feel as if you’re driving a small sporty sedan, not a bloated box to carry kids and sports equipment around. Perhaps the best description would be a sedan on steroids. 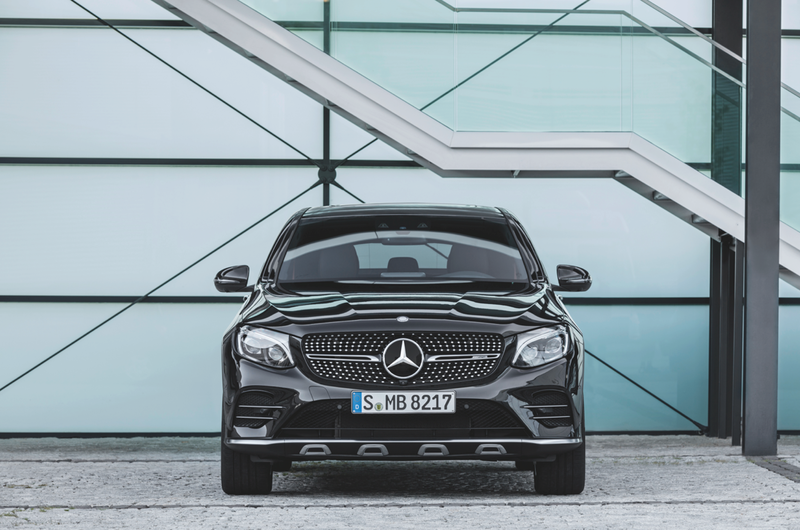 Powering the GLC 43 with a twin-turbocharged 3.0-liter, six-cylinder engine. Make no mistake... it’s a screamer. Put the pedal to the metal and the pipes in the car sound more like a Ferrari than a German luxury vehicle. 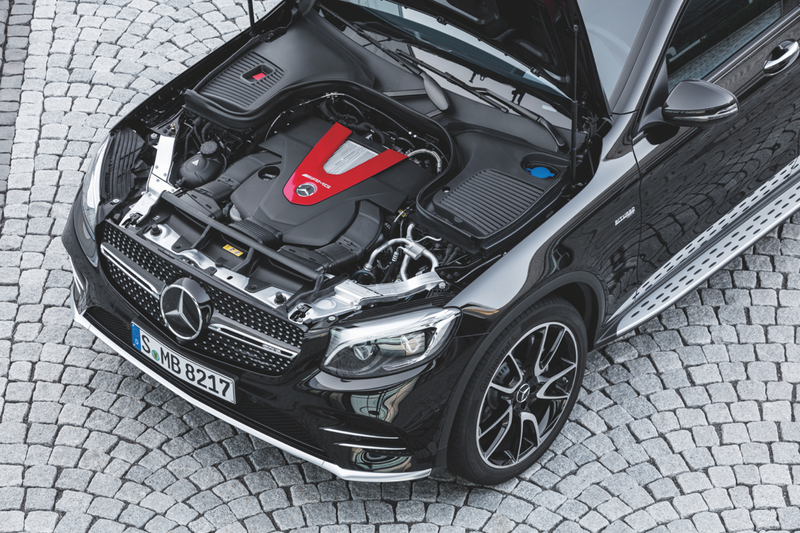 Sadly, the V-6 power plant is not one of AMG’s hand-built engines but it does manage to make a throaty growl and lets driver and pedestrian know that it has a whopping 367 horsepower. That horsepower turns an incredible 384 lb-ft of torque. Make no mistake… this car is a rocket. Mercedes claim it will do zero to 100kph in 4.2 seconds—and their claim is spot on. The twin turbo V6 will blow you away, unlike some of other SUVs that are similarly equipped but with underwhelming engines. The GLC’s nine-speed 9G-TRONIC automatic and all-wheel-drive makes this ride smooth. The drive torque is split in a ratio of 31 to front/69 to rear, which makes for excellent handling and traction. The AMG-enhanced transmission nimbly fires through its gears with ease. 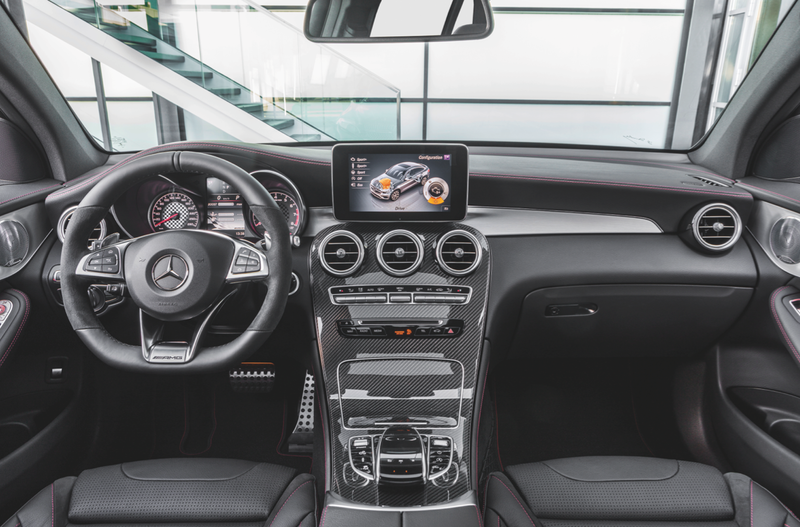 In fact, AMG took Mercedes’ 9G-TRONIC transmission and added dedicated software that actually reduces shift times making the shifting effortless and fast. Like most of all luxury SUVs, this Mercedes offers selectable driving modes from Comfort to Sport or Sport Plus. For those who have a green streak in them there’s even an ‘Eco’ mode, which I didn’t try as it seemed a shame to bridle the beast and limit its power. Finally, AMG offers is an ‘Individual’ mode, which allows drivers to select and save their own personal throttle, steering, suspension, and gearbox settings. The Mercedes is slightly more softly sprung when compared to other crossovers. The soft ride is most likely due to AMG’s three-stage adjustable air suspension. You can tweak the ride you want, which provides for excellent handling even on challenging roads. Still, even with the softer ride, the handling is tight and precise. And because it’s air suspension, ground clearance can be changed with the touch of a button—a very nice feature. Also, during sudden load changes, fast cornering or braking, a computer will adjust the suspension to compensate and balance out the load or roll. 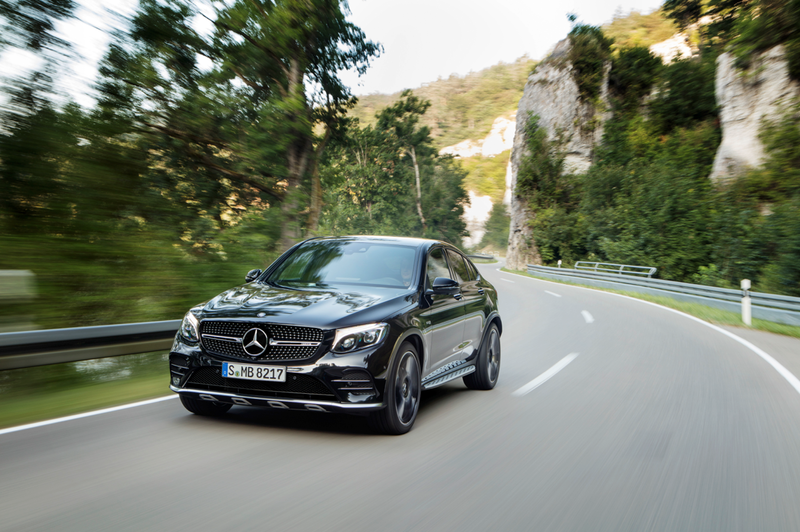 One thing that took a little getting used to was the GLC43’s electrically assisted steering. I found that the car tended to over steer at times. However, the light and precise steering more than makes up for what you lose in road feel. One reason why this car drives more like a sedan than an SUV is due to its fortified front axle with more negative camber. As you would expect the AMG interior on this vehicle is luxurious. The upholstery is black man-made leather and faux suede. A plus is the red stitching that helps accent the seats and dash. The cockpit is a bit on the small side, but over all instrument layout is excellent. However, AMG and Mercedes should go back to the drawing board when it comes to their digital display, which, in this case, is mounted off the dash in the middle. It looks as though the designers forgot about putting one in and ran out of space. Today, most car manufacturers incorporate the display into the dash. Also, the orientation of its panel’s controls needs more attention. Along the main console is a rotary dial thing with a flap on it – I really couldn’t figure how to work it. Making selections for the LED display is counter intuitive. Overall, the space in this AMG is not as big as you’d expect in an SUV. However, it is one cubic foot bigger than a Porsche Macan. Even with the hatch back configuration, a family would struggle with the space limitations on this crossover SUV. AMG not only installs high performance equipment on its vehicles, it also dresses up the more conservative Mercedes design with some racy touches. On this car is a sportier front grill and a more sculpted rear end. However, while the additions can make the car look more aggressive, sometimes it can work the other way. On the Mercedes-AMG GLC 43 they attached alloy running boards right beneath each side sill. It looks odd and doesn’t function well at all. This car is too small to have a running board and what’s more, it impedes getting into the car. As you try and seat yourself, your foot gets hung up on the protruding metal board. It may look trendy but, if you buy the car, I’d suggest you remove this feature. The new GLC 43 won’t make a lot of sense for those looking for a family SUV. As an SUV it suffers a bit because of the ways SUVs are put together: from higher centers of gravity to increased bulk. This is often at odds with performance. But that’s where this Mercedes-AMG vehicle shines. It’s a joy to drive and will set your heat pumping. And its all wheel drive, ride, luxury and stellar performance will make you a very happy diver. Oh, and this car also has a back seat that will actually fit a couple of average sized adults without complaint! 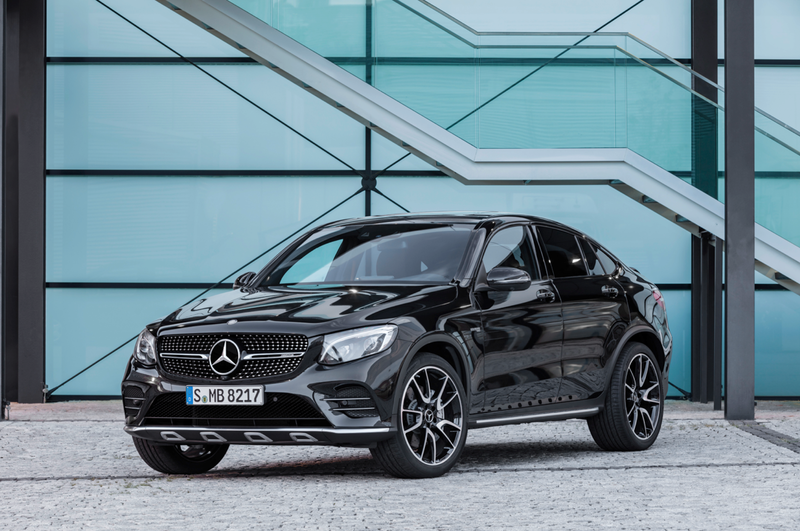 Overall, AMG’s GLC43 is a formidable contender in its crossover class.